The Protection of Life during Pregnancy Bill has passed all stages of the Oireachtas and now goes to President Michael D Higgins. 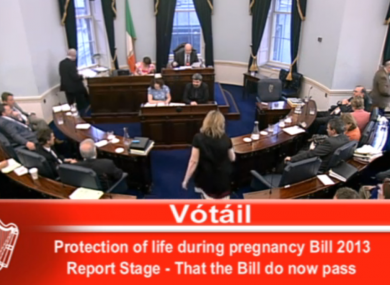 THE SEANAD HAS passed all stages of the Protection of Life during Pregnancy Bill bringing an end to weeks of debate on the landmark legislation in both Houses of the Oireachtas. The legislation now goes to President Michael D Higgins who will either sign it into law or invoke Article 26 of the Constitution and refer it to the Supreme Court to test its constitutionality. There has been speculation in recent weeks that the President may decide to do this but he has given no indication either way. Presidents have only invoked Article 26 on 15 occasions in the last 73 years. Normally, the President has between five and seven days to sign a bill into law or refer to it the courts. Tonight, the legislation passed by 39 votes to 14 in the upper house with no surprises in the voting. Ten Fianna Fáil senators voted against the bill as did independent senators Mary Ann O’Brien and Rónán Mullen as well as former Fine Gael senators Fidelma Healy-Eames and Paul Bradford who lost the party whip when they voted against the government last week. Labour senator Marie Maloney, Fianna Fáil’s Thomas Byrne, Fine Gael’s Michael Darcy and independents Feargal Quinn, James Heffernan and Seán Barret were absent for the vote. Read: How does Irish abortion law compare to rest of EU? Email “Over to you Mr President: Seanad passes abortion bill ”. Feedback on “Over to you Mr President: Seanad passes abortion bill ”.